Math Wizards at Work are 50 entertaining classroom ready trade math lessons that are trade related cool math and logic puzzles set in the work place. Math has never been so much fun! The Wizards range from easy to difficult. 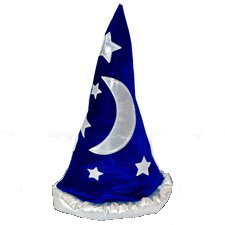 Detailed solutions are provided for each Wizard. They are a great way to add pizzazz to your lessons or as extra credit. Use them as warm-up exercises or as stepping-off points for class discussion or lesson introductions. Math Wizards at Work are divided into trade areas that span the entire Career-Technical Education (CTE) curriculum so there is something here for every trade. Buy the complete book of all 50 Wizards or buy individual Wizards that are best for your class. You can also buy Wizards grouped by trade. For years in my classes, I have had a Wizard contest where the number of Wizards solved by each student were counted and posted on the bulletin board. At the end of the year the top 3 students received hand made wizard candles! Who will be the Math Wizard in your class? 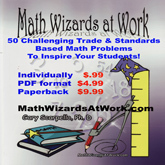 Math Wizards at Work is ideal for CTE vocational teachers, high school math teachers, middle school math teachers, and special education teachers. Math Wizards at Work is a classroom ready math resource that meets academic standards. Each of the Math Wizards At Work is Standards based trade related math puzzles and problems. Use them to strengthen word/open-ended problem skills for high stakes tests. Have students write out how they solved the Wizards, explain and defend each step of the solution in paragraph form, and show all work! "Students found the Wizards challenging and were actively engaged with solving the problem. I can't wait for more Wizards to use in my class." "We do not often find challenging math problems from the academic world that have a true connection to career and technical - most are obviously contrived, use numbers that make no sense in the real world, or use situations that are not applicable or, sometimes, ridiculous to the tradesmen. So far, I am receiving only good comments about Math Wizards." "My class spent almost the entire 2 ½ hour session working on the set. Students drew diagrams, discussed and eventually came to the solutions. I liked it because the students were thinking and working together." Gary Scarpello, Ph. D. Presented "Tips for Teaching Math to CTE Students"